I need a logo that will represent a social enterprise. I have some rough sketches just need the idea to be turned into a really good logo that can set the brand. 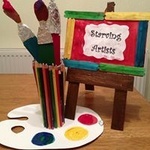 Mobile visual art classes for adults.